Kali Katerberg/Daily Mining Gazette The Hancock City Council made a motion supporting the nomination of former Hancock High School to the National Register of Historic Places at their Wednesday meeting. HANCOCK — With snow on the way out, the City Council approved several park and beautification-related items at their Wednesday meeting. 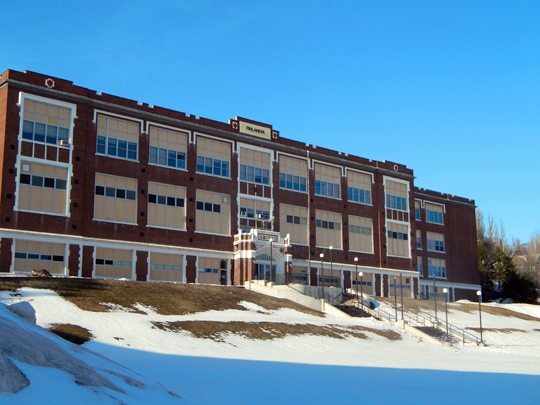 The council unanimously supported the nomination of former Hancock High School to the National Register of Historic Places. Now owned by Finlandia University, the nomination could open the property up for grants and other funding opportunities. Currently, the Hancock Historic District ends at the city hall excluding the building. Terrace Park will get some improvements after the council accepted a $20,000 grant from the Portage Health Foundation. The project would include tennis court upgrades. City Manager Glenn Anderson hopes the grant will help the city take the park to one of the best. Later in the meeting, the council unanimously accepted the 2018 and 2019 millage projects for the amount of $115,000. In the second year of the millage, the funds will go towards funding the beach dock, playground structures and the driving park improvements. The construction bid from MJO Contracting for the Hancock Waterfront Recreational Pier project was accepted at $312,437.94. The pier is a top area of requested improvement for both residents and visitors Anderson said. With the projects underway the idea of adding a Bocce Ball court was suggested. The recommendation comes after high popularity at the Italian Festivals. The council also had a moment of silence for two influential community members, Rob Roy and Ray Gerhart.